For the first time this year, we moved our small sandbox inside. Encouraging the dinosaurs to roam freely in this new medium has brought about many ideas. The drift wood from the science center joined the sandy tableau and became a range of props from nests to surfboards to fences. Once the fences became popular, the small craft sticks were added so that they could make appropriate cages to keep the dinosaurs safe from predators. While playing with one child, I was presented with the perfect segue into our next activity. She pushed her hand down into the sand and exclaimed that I had try, too! 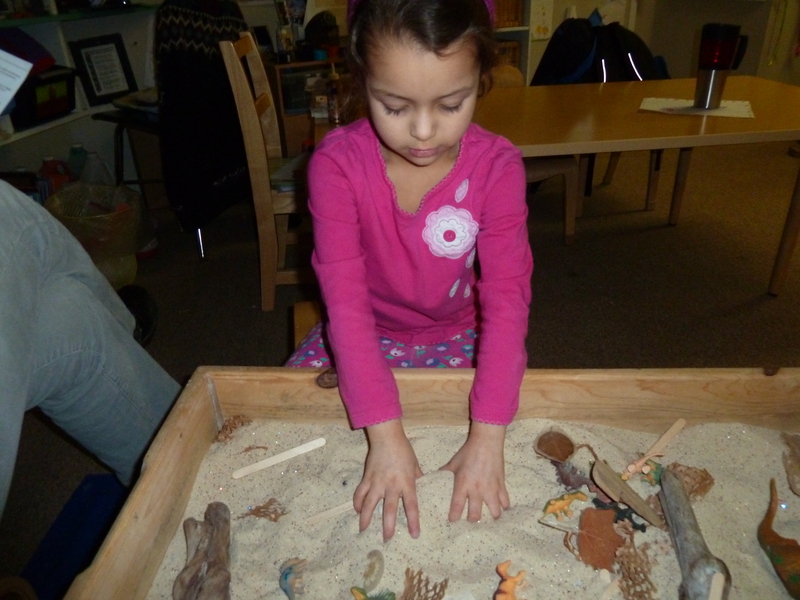 She was so surprised by the detail in the print, she began making dinosaur body prints in the sand. She called them dino angels, referring to her own love of snow angels. If you are looking for the academic knowledge found in this activity, look no further. 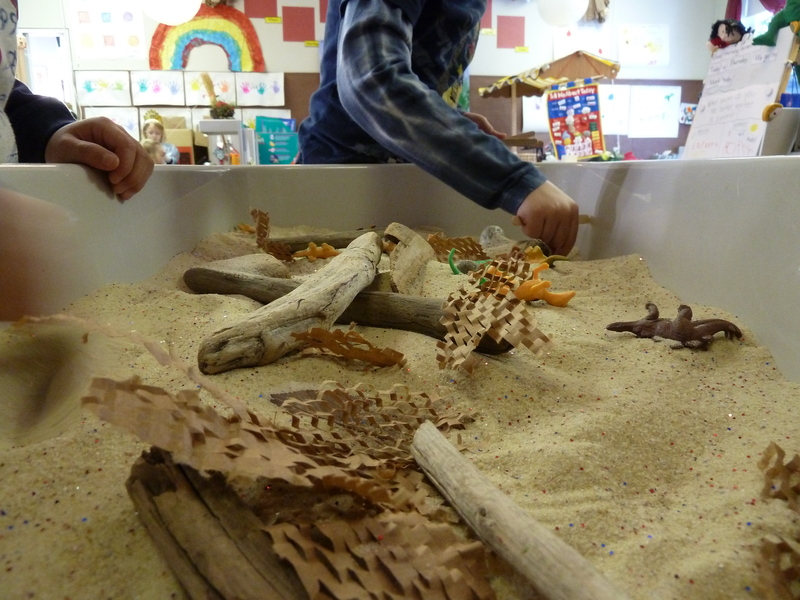 We’ve sorted the contents of the sand box by size, by texture, and by type of material. The children have arranged dinosaurs in different sets and counted their totals. We’ve compared the heights of the dinosaurs and the drift wood. A miniature scale was created using a rock and a piece of drift wood to experiment with “heavy” and “light” objects. We’ve used our fingers to draw letters on the sand representing the beginning sounds of various dinosaurs. As the children built walls, fences, and cages, they were dabbling in early engineering, creating a design, testing it, and adjusting it as needed to develop a safe, sound structure. Yet, as you know if you’ve been with us for very long, each of the children gained just as much social learning during this new activity. A willingness to share and take turns had to be an obvious prerequisite when some of the dinosaurs didn’t have a twin. Many of the tools we used for “zen gardening” came only as a single piece, to be shared slowly and with patience. The dinosaurs, themselves, told tales of family structure, friendship, anger, frustration, forgiveness, and joyousness. Watching the children work together to decide which dinosaurs would be the Mommies and whose would play the Daddies enlightened us about the children’s development in the areas of social confidence, willingness to share leadership, and comfort with our group. The students took risks when building new structures, practiced quiet frustration when they didn’t turn out as planned, or expressed pride when they accomplished a challenging task. This is why our class learns via a project based vehicle. The children and I have access to all of the academic knowledge we might ever wish to absorb and assimilate while working on tasks and playing in ways that naturally spur our curiosity and social interactions. We learn, together as a class, as whole people. The knowledge we gain is intertwined with the actions we do, the emotions we feel, the mistakes that we make, and the challenges we approach. As we grow and learn, new information is examined and placed as it fits with the old ideas we hold. Theories that no longer make sense are tossed out (such as “if something is bigger, it must also be heavier”). The connections we make as we learn new, novel information are what make learning happen.